The User Flow section provides information on the numbers and percentage of people who have completed the three different sections of the tool. This gives you an idea of the drop-out rates at each stage of the tool. The ‘Total’ at the top of this section corresponds to the total number of users who have registered a username/password within the Tool. The Demographic Breakdown provides a far more detailed look at the information provided in User Flow. 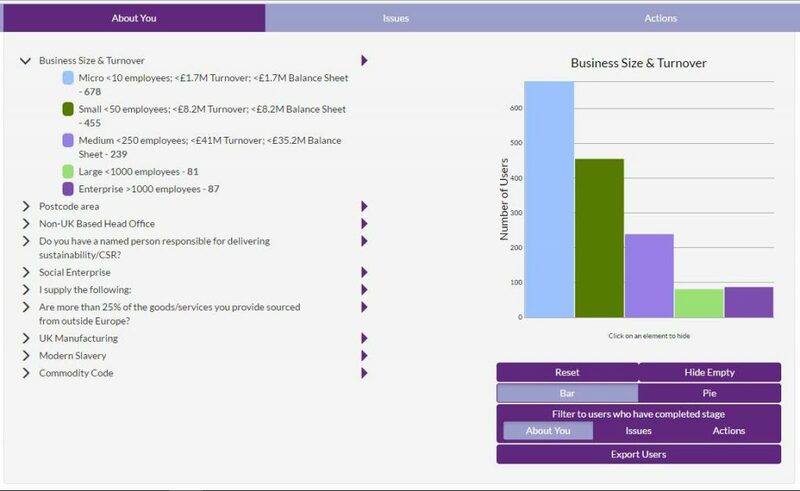 By selecting categories and sub categories of suppliers (using the triangular arrows on the right of the list) you can see the numbers of different kinds of suppliers who have used the tool along with a graphical representation. Looking at this data tells you the breakdown of suppliers by business size, commodity code or other demographic selection of your choice. The screenshot shows the number of users that have completed the “About You” section of the tool but you can also filter this information by those suppliers that have reached the ‘issues’ or ‘actions’ stage of the tool. The pre-defined Issues section displays the table below which presents data on the issues users have selected. The filter and sort buttons on the top row of the table can be used to manipulate how the data is presented. You can look at the demographic breakdown of each issue. This indicates the specific issues that are of importance to different suppliers. This can be used to highlight problems that need to be addressed during your contract management discussions or other communications with suppliers. This section shows data about the pre-defined actions within the tool. The data is presented in a similar way to the pre-defined Issues section. 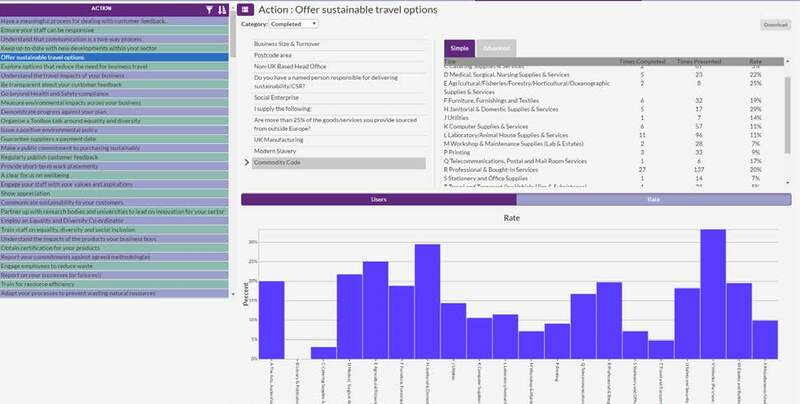 As with issues, you can look at the demographic breakdowns of actions to assess the type of supplier completing each action.